Hey! I believe some of you might have noticed that my hair now look healthier and shinier with my new hair style and darker hair color. Since the Dove event, I have been using the Dove Intensive Repair Shampoo, Conditioner and All Day Repair Cream for more than three weeks. I can see the difference and feel great every time I wash my hair. I have no problems washing my hair everyday because Dove does not caused dryness, dandruff, split ends and hair fall to my hair. As for now, I am happy with my dark brown and straight hair. I think it makes me look fresh and young plus it’s easier to maintain. I do not have to go to salon to touch up my hair color and treatment every 3 weeks. Before this my hair was quite dry and damaged at the end due to my excessive coloring and perming. Now with the new Dove Intensive Repair hair care products that I have, I can do my own hair treatment at home. Save time and save money, yippee! After washing my hair using the Dove Intense Repair Shampoo & Conditioner I feel that my hair so fluffy, smooth and manageable. My comb glides easily when I comb my hair, less tangle and less hair fall now my hair is now stronger. As usual I love Dove’s signature scent, it is very memorable. Both the Shampoo and Conditioner does not cause any dandruff, oiliness, sticky, itchiness or oily scalp. I use it every day, its helps repair and strengthen my hair. Dove Intense Repair Shampoo 375ml retail at RM14.90, the texture is moderate thick fluid, the colors is white with pearlized finish. Just pour about a coin size and add some water, lather and massage the shampoo on wet hair for a few minutes and rinse thoroughly with room temperature water. Tips: do not scratch your scalp or leave the shampoo on for too long. Try not to use hot water to wash hair because it will cause dryness. Dove Intense Repair Conditioner this hair conditioner is only RM9.90 for 180ml and it works like those professional or salon hair conditioner. Just pour a coin size on the palm and apply it on wet hair after shampoo, leave it for 3 minutes and rinse thoroughly with room temperature water. Tips: Only apply conditioner from middle to the end of your hair means the length is about below the ear. Please avoid the hair roots and try to avoid using hot water. This is a must have product! Dove Intense Repair All Day Repair Cream is a leave on formula that keep hair moisture for 24 hours. I love this so much when I travel I carry the smaller bottle 40ml. 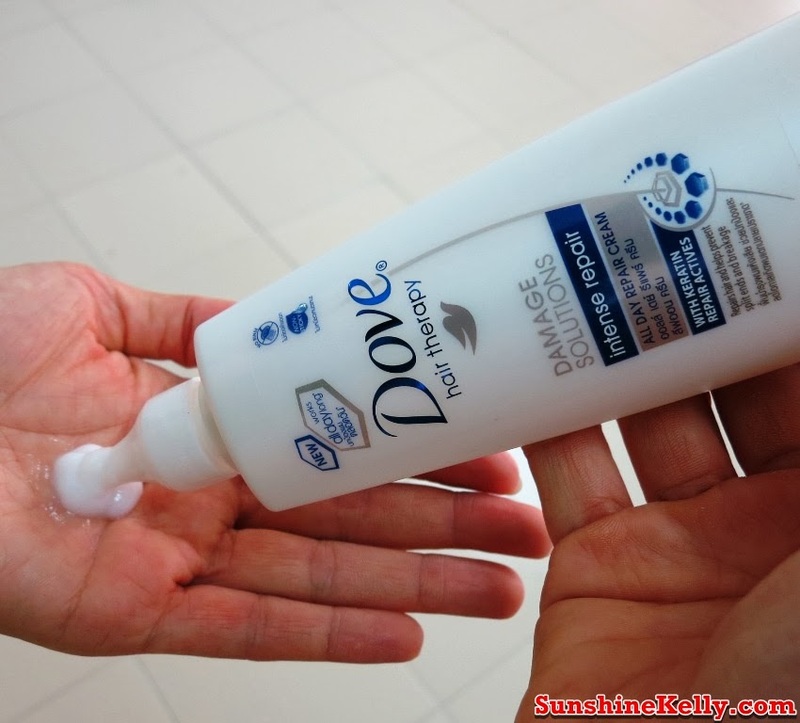 After I shampoo and condition my hair then I pour a small amount of Dove Intense Repair All Day Repair Cream on my palm and spread it evenly on my palm before smooth it on the end of my hair. Immediately I can see those unruly and dry hair end became straight and moisturize. I also apply a little bit on my forehead baby hair to make them look tidy. There is no residue, stickiness or oiliness. 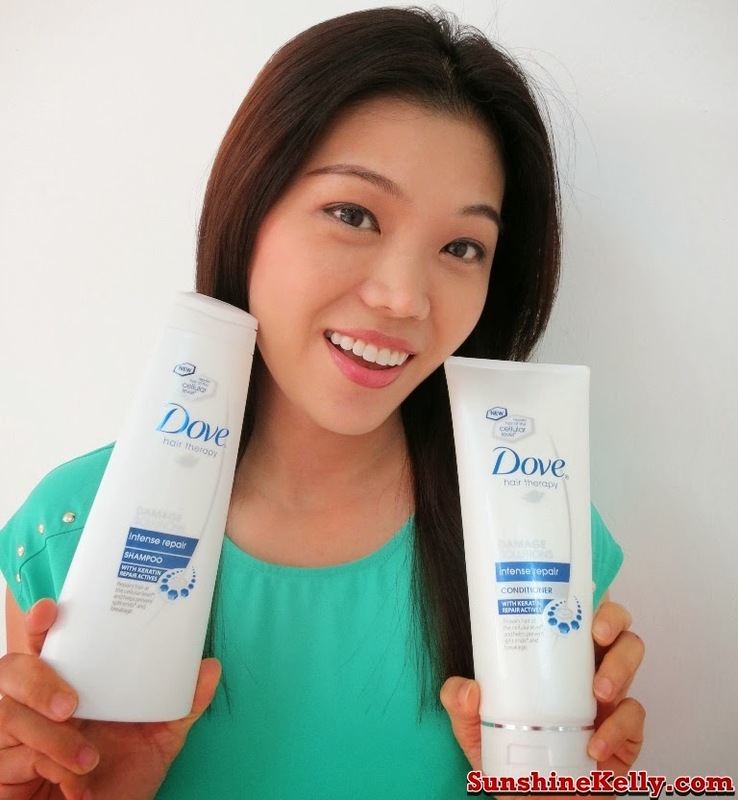 I like the light and smooth hair texture after apply Dove Intense Repair All Day Repair Cream. Tips: please do not apply on hair root. 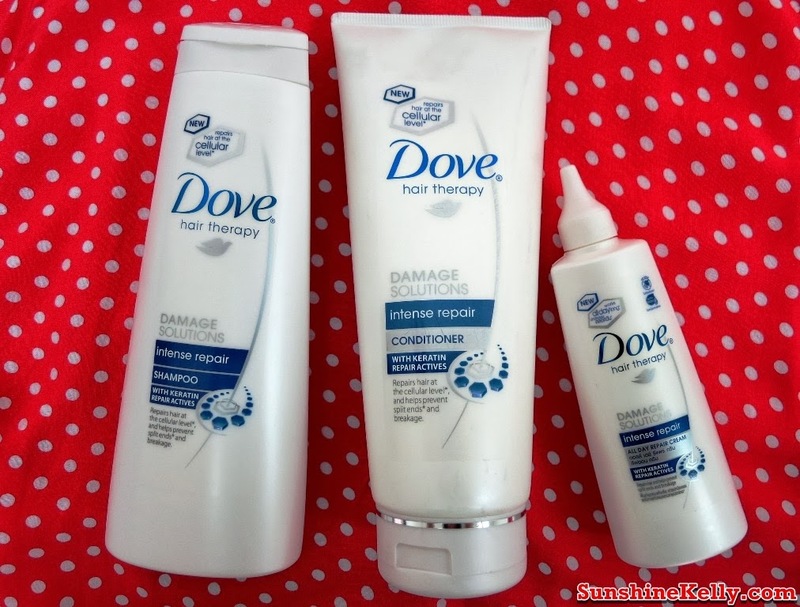 Overall, Dove Intensive Repair Shampoo, Conditioner & All Day Repair Cream is my solution for dry and damaged hair. It restores back hair moisture and shine. Not only it helps to repair hair damages, it also gives hair 10 times stronger with its patented Keratin Repair Actives. This hair care range is great for everyday uses without hurting my wallet because the price is very reasonable. My hair is now smoother and shining. 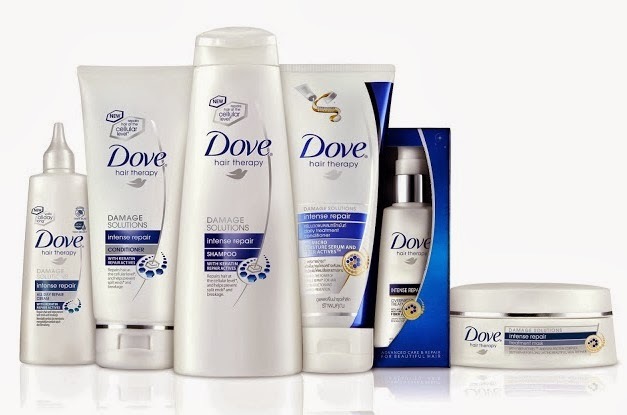 Besides, these three products, there are three more in the same range such as Dove Intensive Repair Daily Treatment Conditioner, Overnight Treatment, Treatment Mask. Get a good hair day every day with Dove.